Home / Blackjack / What is a ‘Charlie’ in Blackjack? If you have come across the term “Charlie rule” or “Rule of Charlie” when playing Blackjack and you are unsure what this means, then don’t panic! We can explain this relatively simple anomaly to you. 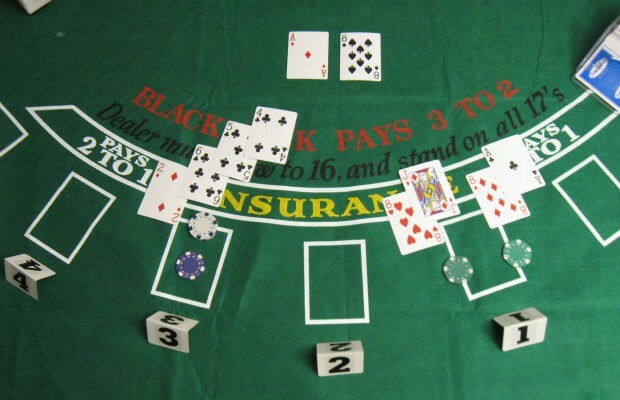 In some blackjack games, players are given an extra incentive to play by the addition of “Charlie” rules, they can be 5 card (rare), 6-card or 7-card Charlie rules and each rule lowers the house edge in favour of the player. In essence a Charlie Rule is that when a player is dealt a specific number of cards without busting over 21 (5, 6 or 7 cards as shown in the examples above) then regardless of the hand the dealer holds, the player will win that pot. A 5-card Charlie happens on average every 50 hands and it is therefore rare for casinos to offer players such a large advantage, however many casinos do offer 6-card and 7-card Charlie rules, which allows players an additional way to win, even if the dealer holds a particularly strong hand against them. How much is the advantage? Well, if you can find a 5-card Charlie game then this lowers the house edge by a very large 1.46%. 6 Card Charlie reduces the house edge by a much smaller 0.16% while 7-Card Charlie lowers it by just 0.01%. However, if you are fan of online blackjack then any Charlie rule is an advantage to a player as it will lower the house edge, even if it is just a tiny amount. Many online casinos are looking for ways to entice players to their sites and introducing rules such as the Charlie rule helps attract players, especially in the case of 5 and 6-card Charlie rules, as there is a small advantage to the player when playing on each hand. ← Previous Story How Can I Easily Learn Blackjack Basic Strategy?